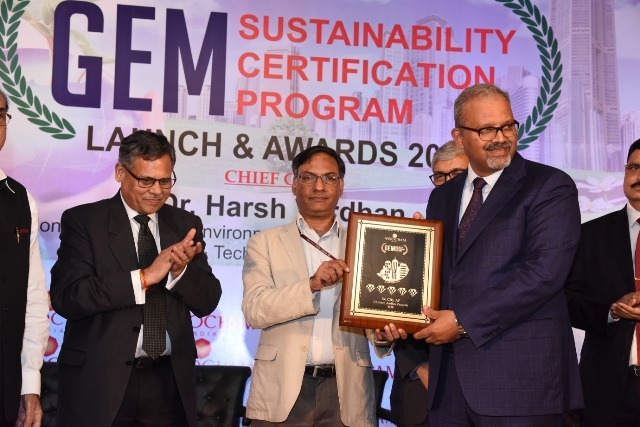 In recognition of its achievement of ‘GEM 5 level’ sustainability standards, which is the highest achievable rating level, Sri City SEZ was awarded the prestigious ‘GEM Sustainability Certification’, hosted by the Associated Chambers of Commerce and Industry of India (ASSOCHAM). In a colourful ceremony organised by ASSOCHAM for the formal launching of ‘GEM Sustainability Certification Programme’ held at Hotel Le-Meridien, New Delhi, on 29 August, Mr. Satish Kamat, President (Operations) received the award on behalf of Sri City SEZ, from Prof. Ashutosh Sharma, Secretary, Department of Science & Technology, Government of India. Mr. Mr. Uday Kumar Varma, Secretary General, ASSOCHAM presented the certificate. Mr. Pankaj R. Dharkar, Chairman, CGEM and some of the senior officials of ASSOCHAM were present during the award presentation ceremony.